In collaboration with Dr. Jonathan Lakey, we are developing a bioartificial pancreas device that is implemented in two phases. In the first phase, the device is implanted under the skin. Once blood vessels have grown into the device via slits, then insulin-producing cells can be inserted into device channels to be as close to penetrating vessels as possible. Our lab can detect oxygen levels within scaffolds via a non-invasive optical technique. Oxygen sensitive dye within tubing is calibrated and placed into device channels for measuring oxygen levels in vivo. J. Tissue Eng. 8 (2017) 204173141769164. Method measuring oxygen tension and transport within subcutaneous devices. J Biomed Opt. 19 (8), 87006. In collaboration with Dr. Gregory Weiss, we are developing a continuous insulin monitor to better inform the artificial pancreas algorithm for accurate insulin dosing. 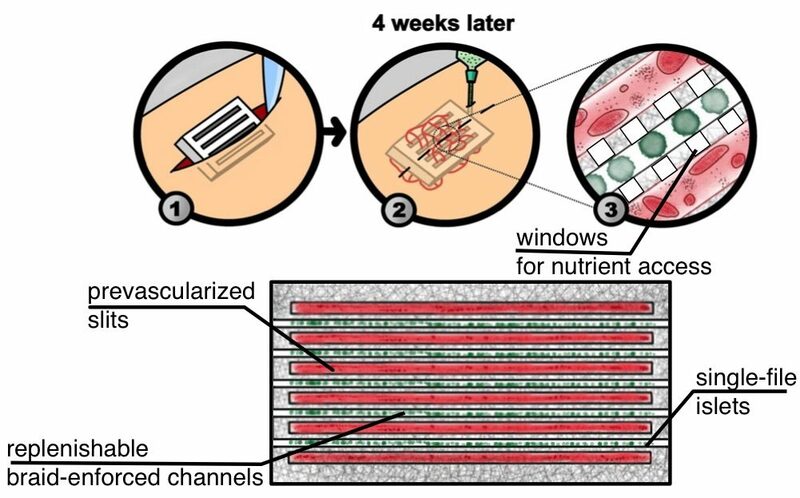 To achieve this, the Weiss lab is engineering the human insulin receptor to be incorporated into an implantable system for continuous monitoring. Currently, insulin infusion sets need to be replaced every 3 days to avoid blockage from the local tissue response to the inserted cannula. In collaboration with Dr. Ali Mohraz, we are developing a bijel-coated cannula to delay the foreign body response and make insulin infusion sets last longer in the body.